BBa_K567018 - submitted by iGEM11_SJTU-BioX-Shanghai in 2011. Fig1. shows no growth :( One of the many lessons we have learned this year is that science doesn’t always go as intended. Each plasmid was provided to our team in distribution kit plate 2 (wells 1O and 17D), as an insert in pSB1C3. 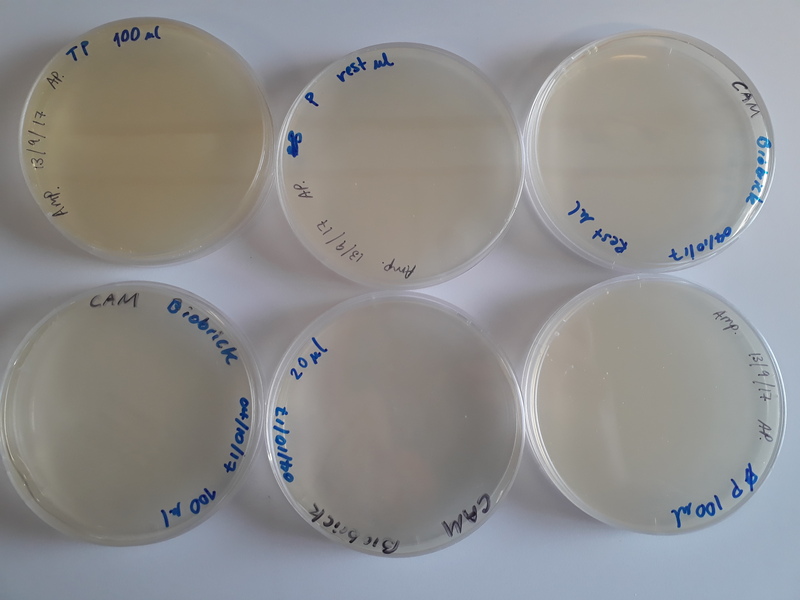 The first round of testing we transformed DH5𝛼 by heat shock using 2 µL of resuspended plasmid (200-300 pg/µL) as recommended on the iGEM website. Bacteria were plated on chloramphenicol plates (30 µg/mL) that had been previously prepared. These were incubated overnight at 37°C. When no growth was observed, a second transformation was attempted. This was done using the remaining 8µL of DNA and plated on freshly made 25 µg/mL CAM plates on the suspicion that the previous plates contained a concentration of antibiotic that was too high for the expression of resistance conferred by the pSB1C3 backbone. Once again, no growth was observed. The CAM resistance provided by the pSB1C3 plasmid was either not expressed, or was too weak for the concentration of antibiotic that we used. Our kit plate samples may have been left at room temperature or dry for too long and thus the DNA did not suspend/transform appropriately. Particularly for sample BBa_K880002, other factors may have been needed and the particular method that we used to test the activity was inappropriate as we did not understand the functionality of the part. We hope to learn from the experiments conducted this year so that future New Zealand teams make a positive impact on the registry.